Vera along with its coast is one of the most soothing places that you can find for relaxation and rest. 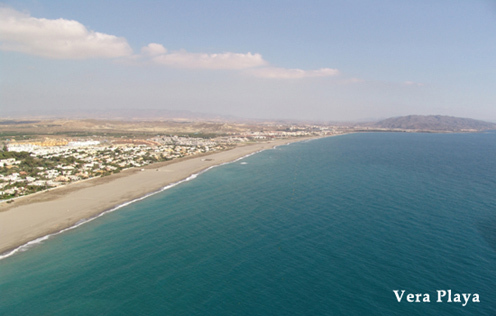 The beaches in Vera Playa, 8km of sandy beach, which do also include a naturist urbanization and hotel opened in 1989, are known globally for purity as well as quality and this is exactly why it has managed to win a blue flag rating for the town. The area now has several hotels and beachside developments. Windsurfing, golf, tennis, small engine plane rides, and taking a stroll along the promenade may be some of the conspicuous outdoor activities that the town has to offer. The lagoon at Puerto Rey which is of historic importance and has been renovated (between Puerto Rey and Villaricos and said to be the place where Hannibal landed his elephants in Roman times), only recently is worth visiting to say the least. It has been declared as a nature reserve because of its museums and Convento de la Victoria. Vera’s water park (open from May to September and has slides, pools and play areas) promises the most fun experience that you can have in Spain along with the nearby local restaurants which are internationally known for the finest treats of the region. Since the climate is warm and sunny throughout the year and the development has been done while keeping preserving nature as a top most priority, Vera has every capacity to be an ideal place for residence. If you are considering the option, contact RMB Spain now.